Though originally designed for horseback riding, our gloves have also proved handy from motor biking to fencing in the back paddock and everything in between. The gloves are made from Kakadu's legendary MicroWax oilcloth - the same stuff as our coats - so they'll shed water like it is going out of fashion. 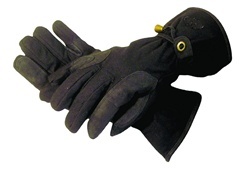 The thin fleecy lining will keep your fingers warm and the draw cord wrist adjusters will keep the wet from getting in. Cowhide leather reinforced palms, wrists and fingers.